- Important players retain shape/stay zonal both in and out of possession. - Blues must transfer ball from blue team to blue team. If Reds gain posession they must find end player (orange), playing the way they are facing. End players recycles possession to Blues. 1. All players must remain in designated zones. Only ball can be transfered between/across zones. 2. Blues must retain possession/look for opportunity to transfer possession. - Defender nearest (inside) to Player applying pressure must always be deepest of unit. - 2nd CB/Furthest FB (angles/distance of support) - remain narrow and compact in shape. 1. Furthest FB from the ball able to enter next zone. (Look to discuss angles/distance of support to player(s) applying pressure on ball - Body should remain open/able to react to ball being transfered and movement in behind. 3. When Attacking Wide Player in possession, Full Back arcs run to &apos;cut off line&apos; and apply pressure high (showing inside). - Central Player nearest to FB applying pressure must be deepest of unit (stop ball being transferred across zones). 4. Players able to move into defensive zone (Both with/without the ball). 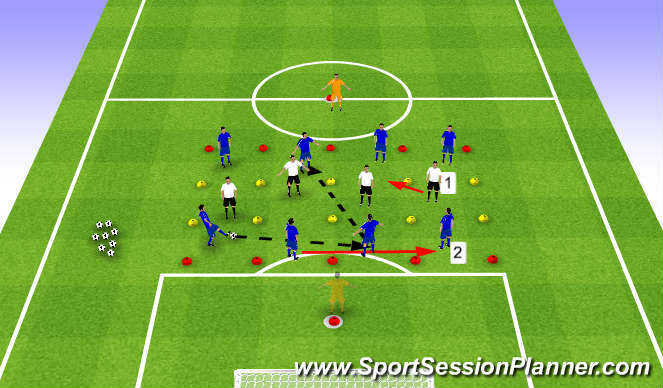 - Important for Defenders to remember roles with more movement in front of ball. 5. Players from receiving zone able to drop deep into defensive zone in order to recieve ball. - Important to remain compact/shuffle as a unit to cut off supply/transfer of ball. 8v8 + 1. Only coaching defensive side (red). Must pay reference to pitch markings. Pitch split into 2, must always be a Back 4 against a Front 3. Neutral players (orange) can play anywhere on the pitch. - Defensive unit must remain within own half to start. - Pressure on the ball (When/Where/Who/How). 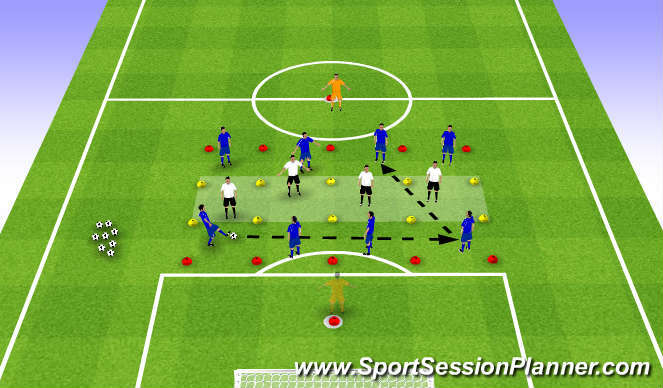 - Back 4 movement when ball is played central (compact)/wide (shuffle), both in defending and opposition half. - Angles and Distance of support to player applying presure. 1. Full Backs can join attack to create 5v4 whilst in possession. 2. Back 4 can play anywherer within the pitch.